Apply the Salary Grade Compa Ratio to determine market position of current jobs. Compare current compensation (salary grade compa ratio) with the mid-point of the salary grade to check market competitiveness. Seek costs for immediate payment - Quick Fix. Develop a plan to increase pay for those who have fallen well behind the market position. Make ‘Quick Fix’ pay adjustments. Seek costs for general adjustment. Develop a plan to increase pay based on market position and performance levels. Make ‘general adjustment’ pay (around 10%) by managing individuals on the basis of performance over a period of time. No reduction in current salaries and allowances. No automatic increase because the existing pay for the grade is below the proposed range. Achieve migration to the new salary structure by managing individuals on the basis of performance over a period of time and apply the quick fix approach. Under-performing staff should not be given salary increases even if they are below the minimum. Use of performance management to determine eligibility of targeted job holders for a basic pay review on an annual or bi-annual basis. This is usually achieved through the use of a ‘Salary Increase Matrix’ known as a Compa Ratio. Accept that there may be some attrition whereby poor performers are dissatisfied and decide to leave. Position-in-range becomes your primary pay administration tool once the salary structure is developed and approved. Ranges are typically divided into thirds or quartiles with defined expectations of employees at each level. The midpoint of the salary range serves as the basis for external market comparison and is associated with performance and/or experience that Meets Job Performance Standards. Salary Grade Compa Ratio in its simplest form it is the ratio of an employee’s current wage to the organization’s benchmark rate, usually the salary grade midpoint. Compa Ratios are frequently used as one factor in wage increase matrices used to determine annual salary increase adjustment. Learn more about our Sales Incentives? Judy earns 10,000/= a monthly salary with a salary grade midpoint of 15,000/=. The equation is 10,000 divided by 15,000 = 0.67. The employee is said to have a Compa Ratio of 67%. Sarah earns 17,000/= a monthly salary with a salary grade midpoint of 15,000/=. The equation is 17,000 divided by 15,000 = 1.13. The employee is said to have a Compa Ratio of 113%. The ‘Quick-Fix’ is required to address urgent and immediate anomalies. Compa Ratio segregates those who have fallen behind the market (less than 75%) with those who have been able to maintain an aggressive position (more than 125%). The ‘Up-Lift’ reflects the degree of need for an adjustment. Those above 125% do not require an adjustment. Those below 75% require an increasingly large adjustment. The combination of a position in a salary grade and performance rating in a matrix form create guidelines for salary increase allocation. 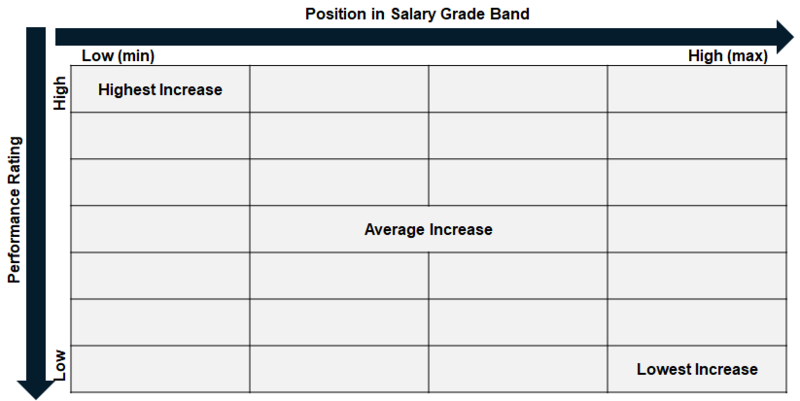 The General Adjustment approach will be used to compare performance against the employee position (Compa Ratio) in the salary grade band. This is subject to a robust Performance Management System. For the more General Adjustment a three-by-three grid below is used to compare performance against grade band position. The percentage increase mentioned in the below table can be adjusted based on the available budget allocated for realignment. Compa Ratio can be confusing and keep communications as easy to understand as possible and be sure to provide clear examples to help break down complex financial information into simple pieces. The compa ratio approach to making compensation fairer and more competitive is to first apply a Quick Fix where major problems exist and then to apply a more General Adjustment which will consider pay positioning within the grade through a ‘first-cut’ view of performance as well current pay levels against market indicators.